The world is changing, and so is the way we do business and even live. Many leaders are struggling to keep up. We believe that the only way leaders can survive is to be part of this transformation. 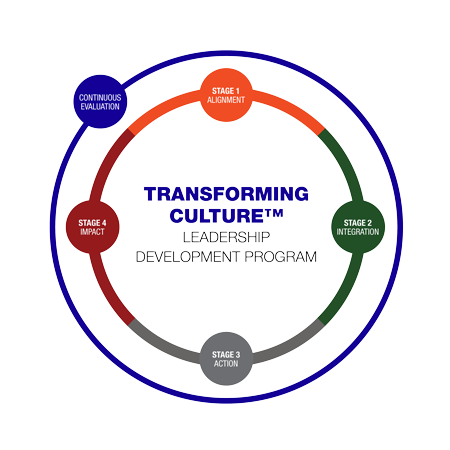 DCC's Transforming Culture™ Leadership Development Program develops the skills and behaviors needed to transform an organization’s culture and, by doing so, their business results transform too. The program consists of six workshops and a program of one-to-one coaching that provides a foundation for learning and mastering the skills needed to become a Transformational Leader. Utilizing cognitive and experiential learning models, participants will engage in a multi-modal learning experience that includes: concepts and theory, relevant research, and hands-on experiential practice and coaching with relevant, real-world examples. The multi-modal approach enhances retention and integration of intended behavior changes. This model is consistent with research which demonstrates the superiority of behavioral change programs that incorporate behavioral modeling, substantial practice and individual dialogue. The program has been developed in partnership with David Paul, M.D., Ph.D., and Bonnie Paul, Ph.D., both experienced educators with expertise in leading culture shift and behavior transformation in organizations, including the critical leadership skills that lead to emotional competence. They are educators and coaches who masterfully “walk the talk,” an essential element for success in programs that incorporate behavioral modeling. This program affects real behavior change and new habits to create more effective leaders and a transformed organizational and business culture. Successful teams start with successful individuals who are supported to contribute collectively to the company vision. Learning how to communicate isn't generally taught, so when conflicts arise at work, how do you communicate effectively and with respect? Giving feedback can unintentionally cause defensiveness. Learning to give and receive feedback can completely transform your company's culture. Learning to handle conflict directly and neutrally is essential for leaders. Employee engagement is at an all-time low. When companies learn to value each employee's strengths, anything is possible.